Spring is coming along nicely at the Museum. We’re super excited about our blooming garden and growing programs related to native plants. For May’s Collection Close-Up, we have arranged a tour of our fossil plant garden. Rather than heading outside, this garden tour will take us into the paleobotany shelves of our paleontology cabinets. Paleobotany, or fossil plants, is an interdisciplinary field relying on both botanical and geological expertise to investigate questions related to the evolution and natural history of plants. 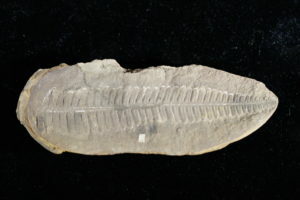 By studying fossil plant material, paleobotanists learn about the ancient organism and also delve into questions such as whether the specimen has close living relatives, how the fossil’s anatomy compares to that of modern plants, what the specimen can tell us about the relationship of different layers of rock and what the specimen can tell us about the the environmental conditions in which it lived. Not all plant material is resilient enough to be preserved; often it decays or is consumed before it can be buried (and be on its way to fossilization). As a result, plant fossils typically consist of parts of the plant — most commonly, individual leaves or stem pieces. They are also often preserved as imprints of the original specimen in the rock which holds them instead of preserved material itself. There is still surprisingly a lot of information you can gleam from incomplete fossil plants — from size and shape of the fossil to specific structures, such as veins, thorns and even individual cells under the right magnification. 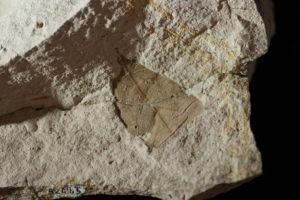 Cordia leaf (Monterey Formation, Miocene epoch). 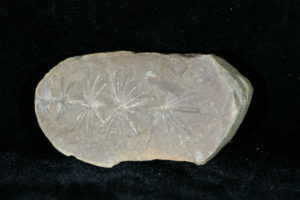 Leaf fossils are the most common macroscopic remains of plants. With its clear leaf shape and veins, this specimen can be identified as a member of the Cordia genus. Stem (Monterey Formation, Miocene epoch). This impression of a stem was found by a Soquel High student in the 1970s. If you look at it closely, you can see the impressions of the plant’s thorns, which are identified in this image by white arrows. Annularia leaf (Francis Creek Shale, Pennsylvanian epoch). This distinctive whorl of leaflets along a stem belongs to a member of the extinct Calamites family, a tree-like relative of modern horsetail plants. 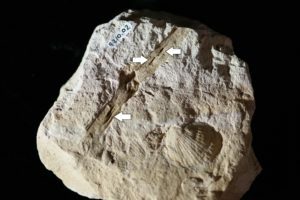 This specimen is one of several in our collection (like the one below) from the Francis Creek Shale, a famous fossil locality known for its unusual preservation of soft-tissued organisms within rounded nodules of rock. Fern leaf (Francis Creek Shale, Pennsylvanian epoch). This beautiful impression of a fern is another great example from the Francis Creek Shale. Both fossil ferns and sphenopsids (like Annularia above) are commonly found within the rock formation, as are a wide variety of uniquely preserved land and marine fauna. For a closer look at these fossils, as well as other exhibits and gardens, stop by the Museum through June to look our Collections Close-Up.